Among the oldest breeds recognized by the Cat Fanciers’ Association, the French Chartreux (pronounced Shar-TROO) was once valued more for its pelt than its personality. Chartreux cats have robust bodies, broad shoulders and chests, short legs, and small round feet. The Chartreux has been unflatteringly described as a “potato on toothpicks” because its legs are so small in relation to its body. Chartreux fur is a solid blue-gray colour ranging from ash to slate, with silvery tips. The coat is lush, water-repellent, and slightly longer than that of most short-haired cats, with a dense undercoat. Other notable features include round golden or coppery eyes that curve slightly upward at the corners and the appearance of being forever smiling due to the shape of its mouth. Males also tend to have jowls or chubby cheeks. Among the largest cat breeds, female Chartreux are usually about 7-10 pounds, whereas males weight 12-16 pounds or more. The Chartreux is slow to mature to its full size, requiring about 3 years for females and 4-5 for males. With their compact bodies, Chartreux cats are heavier than they look. Because they are similar in appearance, some people believe that the Chartreux and the British Blue are two different names for the same breed, but this is not true. The breeds have physical and temperamental differences, and blood typing and pedigree research has confirmed a distinct ancestry for each. It was once believed that cats living among the Carthusian monks of France drank Chartreuse liqueur along with their human companions, and this was thought to be the origin of the Chartreux name. However, recent research suggests that these cats drew their name from an 18th century Spanish wool that their coats were said to resemble. The Chartreux, or blue cat of France, is probably descended from the stocky, ash-gray Syrian cats brought to Europe during the Crusades, where they were initially valued more for their pelts, meat, and exceptional rat-catching capabilities than their companionship. 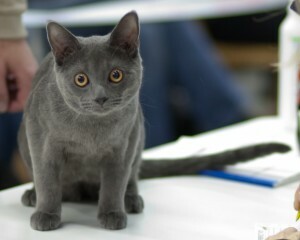 Eventually, cat fanciers developed an appreciation of their more endearing qualities, and beginning in 1928, Chartreux were routinely exhibited at cat shows in Europe. The Chartreux breed was imported to North America during the 1970s, and today, Chartreux cats in the U.S. represent the purest breeding stock, as the European Chartreux were cross-bred with Russian Blues, Persians, and British Shorthairs during World War II in an effort to keep the breed alive. The loyal Chartreux tends to favour one member of a household, following that person around like a dog. Among the more trainable breeds, many Chartreux cats can learn to fetch small objects and come when called. However, despite their intelligence, they tend to learn slowly, so patience is required. Although large and powerfully built, the Chartreux is a gentle and tolerant cat by nature, though there are certainly exceptions to this rule. Most Chartreux deal with conflict by avoiding or withdrawing, rather than becoming aggressive, and are exceptionally sensitive to scolding. The Chartreux is not particularly extroverted, but is not shy either. Rather, it strikes a balance between excessive sociability and introversion, and tends to be affectionate but undemanding. Chartreux cats like to play and are somewhat active, though not as much so as some of the Asian breeds such as the Siamese. Docile and relatively easy going, most Chartreux are accepting of children and other animals. The Chartreux is not one of the more vocal breeds. Chartreux cat voices tend to be quiet, and they are more inclined to chirp than meow upon discovering something of interest. In fact, some Chartreux don’t meow at all, though they do purr, and many also show affection by bumping their heads against people or objects. Among the breed’s more unusual quirks, many Chartreux cats show a fascination for television, and will watch along with their owners. Chartreux cats are prone to dental problems because their incisors tend to be small and close-set, making them vulnerable to being pushed out of place by emerging adult teeth. The Chartreux is also prone to kneecap displacement (patellar luxation), which can cause lameness in severe cases. To avoid this condition, adopt Chartreux kittens only from reputable breeders who screen for genetic problems. Chartreux cats are inclined to put on weight, and many have to be switched to light food at some point in adulthood. Grooming requirements for the Chartreux are minimal, despite its luxurious coat. Daily brushing is not needed. However, owners may wish to brush their cats to get rid of dead hairs during the shedding season, as the Chartreux double coat increases the amount of shed fur (Chartreux cats are not a great choice for allergy sufferers). The price of Chartreux kittens varies depending on bloodlines, championship status, and other factors. Generally, pet quality Chartreux kittens cost anywhere from $400-$1,000, and show quality even more. Many breeders have waiting lists of 4-8 months. If adopting a kitten, Chartreux kittens are customarily given names beginning with the letter associated with the cat’s birth year, following a 20-year cycle (all letters are used except K, Q, W, X, Y, and Z). For example, kittens born in 2002 were given names beginning with the letter “t”, “u” in 2003, “v” in 2004, and so on. Those wishing to save money and provide a home for an adult Chartreux in need should contact the Chartreux Breed Rescue or visit PetFinder’s list of shelters that have Chartreux cats available for adoption. Starbuck, Orca. (2003). 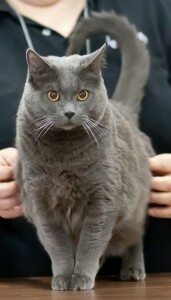 “The Chartreux Cat.” Fanciers.com. Sweeters, Mary Anne, Cat Fanciers’ Association. (11 June 2009). 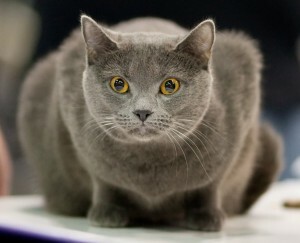 “Breed Profile: Chartreux.” CFAinc.org. The Chartreux Cat Club. (n.d.). “Breed History,” “Breed Selection,” and “Characteristics.” Chartreux.cat.free.fr.